“Sholom Loch Yom ha-Shevi-i” (Sabbath, My Love) is a celebration of the Sabbath Day by the 12th-century Spanish Jew Yehudah (Judah) Halevi. Halevi was a philosopher, a poet, and a physician. The Kuzari, Halevi’s dialogue in defense of Judaism, is considered to be one the greatest philosophical works of the Middle Ages. Halevi’s meditations on Jewish religious and national identity are set against the backdrops of Reconquista Spain and a Jerusalem recently captured by Crusaders. Hide sun and stars from the Fourth-day’s sight? God’s table waits, Sabbath, my love! Are all forgotten, Sabbath, my love! For you have arrived, Sabbath, my love! Circa 1500, a 50,000 line play appeared called Le Mistére du Viel Testament [The Mystery of the Old Testament]. Although it has never been translated into modern French (let alone English), it appears to have influenced a few 16th century playwrights. I recently finished reading the section on Abraham because I am writing a term paper on Theodore Beza’s 1550 play Abraham Sacrifiant. I was particularly struck by the female representation in the Viel Testament version of Isaac’s birth. Hagar, Sarah’s maidservant, gets a surprising amount of attention in the play. Although God promises to care for Hagar and Ishamael in the Biblical story, the Viel Testament Hagar demonstrates more agency than in the original. After Isaac is born, Hagar repeatedly asks Abraham to remember the promise he made to her and her son. Classism is also evoked in the play. 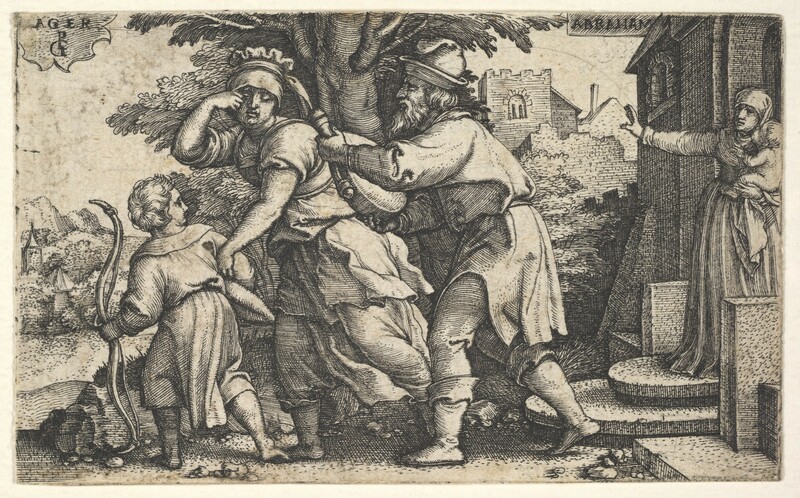 Abraham and Sarah try to silence Hagar by bringing up her social class. Sarah: “Bien, m’ayme, vous me ayderez,/ Car je craing la douleur terrible” [I would definitely like you to help me, because I fear the terrible pain]. Even though this play is terribly obscure, I couldn’t help but share a few passages with you because it is rare to find medieval and Renaissance texts that mention the female experience. I hope to read the other sections of the play in the future. Evidently, Le Viel Testament describes the deaths of Adam and Eve, as well as the fall of Lucifer. Sounds intriguing! The holidays can be a difficult time for people who have lost loved ones. While it may seem that everyone is celebrating life and love with friends, some are alone in their grief. Thanksgiving may be a burden for someone experiencing a loss. It is with them in mind that I write today’s reflection. The 12th century Cistercian monk and reformer Bernard of Clairvaux was known for his beautiful reflections on divine love as well as his fiery and aggressive personality. He was, above all else, a leader. And a leader wasn’t allowed to show emotional weakness – especially an austere abbot. But in his 26th sermon on the Song of Songs, Bernard cut short his commentary to express his grief over the death of his biological and spiritual brother Gérard. Gérard joined his brother in the monastery and became the cellarer of Citeaux. He was Bernard’s lifelong friend and companion. Gérard wasn’t educated, but he kept the monastery up and running. His death devastated Bernard, but an abbot wasn’t supposed to mourn. Monks were taught to anticipate and embrace death. So, Bernard hid his emotions from the other brothers and stoically officiated his brother’s funeral. But in Sermon 26 of the Song of Songs, Bernard finally broke the silence and shared his true feelings with the monks in his care. Perhaps, death was supposed to be interpreted as a great good, but it was only good for Gérard. Bernard had lost his best friend, and nothing would ever be the same without him. All my delights, all my pleasures, have disappeared along with you. Already cares rush in upon me, troubles press about me on every side; manifold anxieties have found me companionless, and, since you departed, have stayed with me in my solitude. In my loneliness I groan under the burden. Because your shoulders are no longer there to support it, I must lay it down or be crushed. O, if I could only die at once and follow you! Certainly I would not have died in your stead, I would not deprive you of the glory that is yours. But to survive you can mean only drudgery and pain. My life, if you can call it that, will be one of bitterness and mourning; it will even be my comfort to endure this painful grief. Could Gérard still hear his brother’s voice? Did he care about his brother’s suffering even though he was in a better place? Bernard concluded that it was impossible for any soul in contact with a merciful God to be indifferent toward the plight of the living. Therefore, Gérard was present in spirit. He did care about his brother’s suffering. But he was no longer in the flesh, and Gérard’s physical presence mattered. I am that unhappy portion prostrate in the mud, mutilated by the loss of its nobler part, and shall people say to me: “Do not weep”? My very heart is torn from me and shall it be said to me: “Try not to feel it”? But I do feel it intensely in spite of myself, because my strength is not the strength of stones nor is my flesh of bronze. I feel it and go on grieving; my pain is ever with me. Bernard may have been the abbot of Citeaux and one of the most powerful men in his day (his student became pope), but he was still human. He was tired of putting on a show, of pretending that death didn’t matter. Will you say then that this is carnal? That it is human, yes, since I am a man. It must have been shocking for the brothers to see their abbot in this emotional state. Many of the monks were former knights, so they were probably accustomed to hiding their emotions and acting tough. In a patriarchal society, men especially feel discouraged to show their true feelings. As I mentioned above, I’m writing this post with the grieving in mind. Holidays can be wonderful times of the year. Friends and family gather together to celebrate Thanksgiving (in the U.S.) or Christmas. But holidays can also be burdensome for those who are grieving the loss of a loved one. They may feel like they have to perform for the occasion, and if they can’t, they may experience guilt and regret. They don’t want to “ruin” the occasion. And of course, they may miss their loved ones the most during the holidays because the holidays are supposed to be joyful occasions. The grieving often experience the most loneliness during the holidays. For personal reasons, Bernard’s story resonated with me when I first read it at the end of 2016. We still live in a society in which emotion is interpreted as weakness. We are asked by society to hide our pain not only at work but among friends, and especially during the holidays. But death is a tragedy. It leaves a mark on the living. During the holidays, we who are not mourning need to remember those who are and give them space and support to do so. Advertisements tell us to have the perfect Thanksgiving or the perfect Christmas. But the need to play a certain role in company (as a teacher, a CEO, a parent, etc) is a huge burden for those who are grieving. They may feel that they don’t matter as human beings. Let’s not preference our celebrations over the lives of our loved ones. If you are grieving, I hope you find the comfort and support you want and need this season.